In the framework of the IUCr-UNESCO OpenLab initiative, Bruker AXS, Chemistry Dept. of Hanoi, University of Science VNU and Hanoi National University of Education jointly organize a workshop in crystallography. 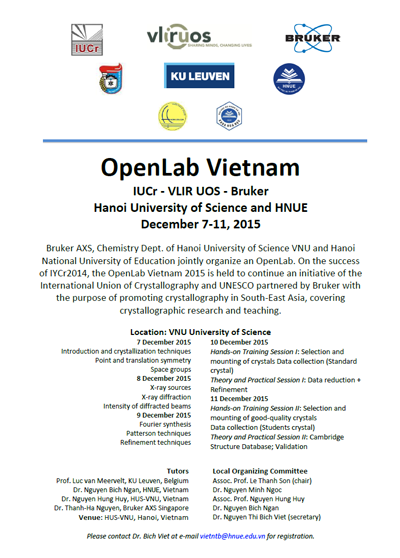 Following the success of IYCr2014, the OpenLab Vietnam 2015 is held to continue an initiative of the International Union of Crystallography and UNESCO, partnered by Bruker with the purpose of promoting crystallography in South-East Asia, and covering crystallographic research and teaching. Deadline for applications is 23 November 2015. Please contact Dr. Bich Viet at e-mail vietntb@hnue.edu.vn for registration.